Unlike most hollow handle survival knives, the Bushman has no joint or seam between the blade and handle that requires a mechanical fastener. Instead, the Bushman's blade and integral handle have been expertly cold forged out of a single piece of 2.5 mm thick SK-5 high carbon steel. The resulting knife has been heat-treated and tempered to RC54 and when subjected to factory tests, has withstood over 2 tons of pressure on its blade/handle transition! Includes Cordura sheath with small storing pocket. 12 1/4 in. overall, 7 in. blade. Nice knife, well balanced. Excellent blade and edge retention. Awesome blade for the money. Didn't come very sharp at all but that's fixable. From what I've seen it should be a very sturdy, long-lasting knife. If I could take only one thing into the wild it would be this knife. 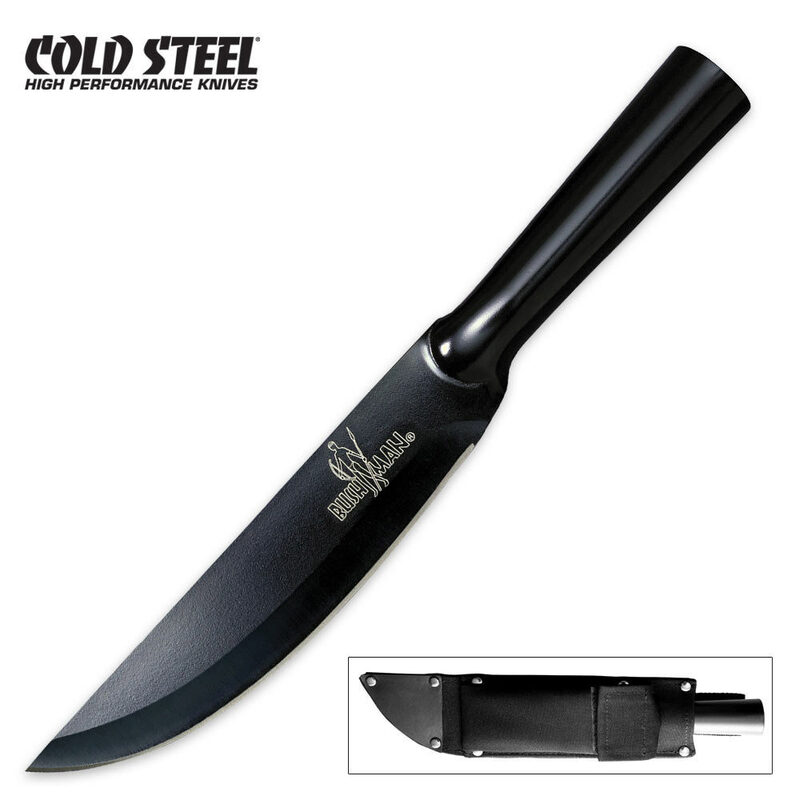 It kept it's edge after constant field abuse, it can be thrown or used to make a spear, and Cold Steel knows how to make tough knives. The capabilities it has as a multifunctional tool are limitless, and the rugged design is extremely durable. You can't tell from the photo but on the opposite side of this knife you see where the metal folds into itself, forming a unique and effective hollow handle, yet there is no seam and the blade is perfectly centered. It may not come with all the extra compasses and whistles like other "survival" knives, but I'd prefer a knife I knew would last me over a cheap excuse with a few trinkets.